ARDNAMURCHAN is the most western point of mainland Scotland. It is a peninsula (meaning "almost an island") between Mull and Skye, enjoying magical views, hidden bays, sunsets over the sea and the relaxing air of the Hebrides ... remote but never cut off. 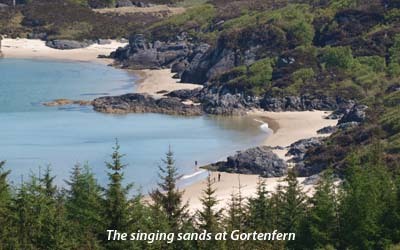 At Ockle, on the north coast of Ardnamurchan, we have three self catering cottages. All are modernised croft houses with Scottish Tourist Board grading. Burnside has two bedrooms upstairs and comfortably sleeps four people; a kitchen/dining room, bathroom and lounge are on the ground floor. 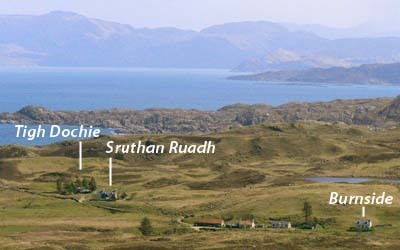 Sruthan Ruadh has a twin-bedded ground floor bedroom, with two further bedrooms (one en-suite) upstairs; this cottage can accommodate six. Tigh Dochie is a small secluded bungalow surrounded by a pretty garden; kitchen & utility room, bathroom, lounge/dining room and two bedrooms makes this a very practical unit for four.